A limited edition art book “Kamino-hikarino-awa Water Ceremony” published on the occasion of the exhibition “MIERU kami“, 2015. Composed of letterpress and mimeograph printing. Limited edition of 250 copies. The special edition includes the art book, a color print by Yurie Nagashima, a piece of 8mm film by Nobuhiro Shimura. All are housed together in a paulownia wood box. Limited edition of 15 copies. Natural stone accessories, raw stones from various regions of Japan, such as crystal from Iwate Prefecture, Yanamashi Prefecture, Nagano Prefecture, garnet from Nara Prefecuture, and topaz from Shiga Prefecture. With enjoyment of greater awareness of the rhythms of life, we hope to bring the experience of everyday life closer to the interaction among natural world. *This event is programmed as part of a satellite program of the exhibition “Otto Künzli” which is held at Tokyo Metropolitan Teien Art Museum from October 10, 2015. Cosmic Wonder’s kamikoromo get their white color from the kozo plant. The ume flower color comes from an Akane herbal dye. The sumi color comes from a wildflower herbal dye. 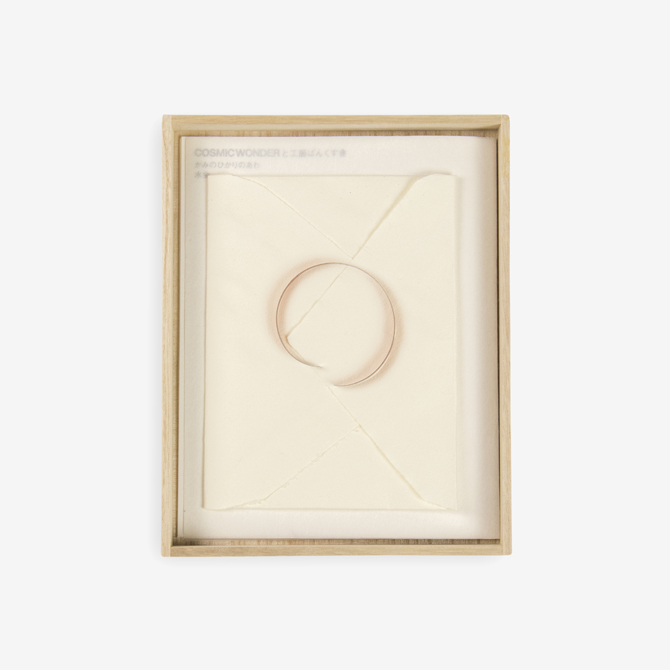 Paper has long been celebrated in Japanese life for the important role it plays in many rituals, ceremonies, and countless everyday activities. In ancient times, Buddhist priests pasted together paper scraps to make kimonos. This tradition lives on in the form of kamikoromo and in the ceremony called ‘omizutori’, which is performed at the Todaiji Buddhist temple in Nara. Ippen Shonin (St.Ippen) traveled throughout Japan wearing kamikoromo. From the Muromachi period onward, kamikoromo spread out through the samurai culture. The one worn by Kenshin Uesugi (one of the most powerful lords of the Sengoku period) is thought to be the oldest surviving kamikoromo. Toyotomi Hideyoshi (a preeminent daimyo) owned a kamikoromo haori (the reverse side was dyed with kobai). 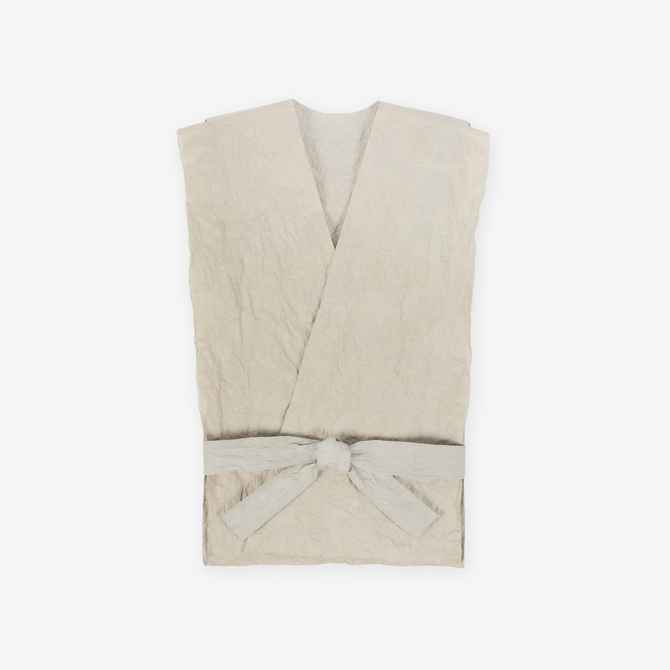 By the middle of the Edo period, the use of these paper robes had expanded to the general population. This is the time of Basho, the greatest haiku poet and a wearer of kamikoromo. Their lightness and heat-retaining quality made them popular among travelers and traveling haiku poets. Kamikoromo embody the sense of wabi-sabi, emphasizing the rustic beauty of nature. In the present day, techniques for the production of traditional paper clothing are still practiced in Shiroishi, Miyagi Prefecture. Today, kozo, mitsumata and gampi are the principal raw materials for washi. Kozo is prized for its long, tough fibers. Kozo is cut at the root and steamed in a barrel over a fire in order to separate the bark. The bundles of fibers are placed in a cold stream for one to three days. The branches are boiled and stripped of their outer bark and then dried. The fibers are then boiled, placed in running water, and naturally bleached. The rinsed fibers are placed in a strainer floating in water for further cleaning and then laid on a board and beaten. Once they have dried overnight and have been softened by stamping or hand-rubbing, they are ready to be made into washi. COSMIC WONDER Kamino-hikarino-awa collection event will go on a tour to the following region in Japan.